There are currently 8 handbags on this page. 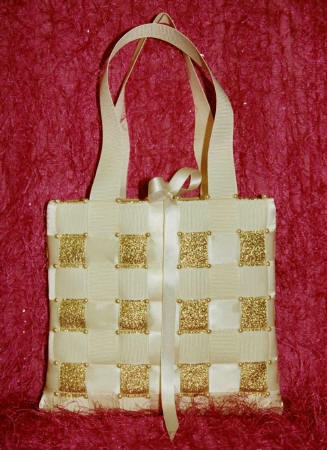 Handmade handbag using Cream and Gold woven ribbons with hand-sewn pearl beads. Gold coloured back and lining, inside pocket and ribbon tie closure. Perfect for a party or wedding. with a pale pink lining, small inside pocket, clear acrylic handles and lilac ribbon tie. complete with a pretty bow on one side. Handmade bag. No two are alike. Earthy tones of soft Homespun fabric, cut and fringed give this bag the name 'Raggybag'. Toning lining and 6 inside pockets, drawstring top, flap with magnetic closure and shoulder handles. Completely machine washable which will improve its softness. This is a beautiful handmade handbag. with a purple velvet back, purple satin lining, and popper closure. make this a very unique handmade. with a navy back and lining, popper closure. © Copyright 2002-2010, Pink Scorpion.